Baylor College of Medicine moved up in both the research and primary care medical school rankings published in March by U.S. News & World Report, securing its position as the No. 1 medical school in Texas and the Southwest and one of the top schools in the nation. Nationally, Baylor placed No. 16 in research intensive medical schools and No. 5 in primary care medical schools. The research ranking is a jump of five spots and the primary care ranking is a jump of three spots. The research rankings include grant funding, student scores and peer assessment. The primary care rankings also include the number of graduates entering primary care fields. U.S. News also ranks several medical specialties. Baylor’s pediatric program ranked No. 10 in that listing. Baylor’s Graduate School of Biomedical Sciences continued to rank among the top programs in the country, listed as No. 26. In 2018, Harris Health System began offering a medical outreach program, House Call Services, that delivers medical care to patients in the com-fort of their homes. While most patients in the program are elderly, several have special needs and require constant medical attention, but not necessarily in a health care setting. Most patients are seen weekly or several times a month. House Call Services includes teams of board-certified physicians, nurse practitioners, registered nurses, case managers and clinical social workers; physician care is provided through Harris Health’s partnership with Baylor College of Medicine and McGovern Medical School at The University of Texas Health Science Center at Houston. Teams are available by phone 24 hours a day, seven days a week to provide primary care for management of medical problems, palliative care to improve quality of life, transition of care visits and home safety evaluations. Houston Hospice was recognized in 2018 for its service to veterans. Houston Hospice earned a Level Four promotion in 2018 from We Honor Veterans, a program launched by the National Hospice and Palliative Care Organization (NHPCO) in collaboration with the U.S. Department of Veterans Affairs (VA) to improve the care veterans receive from hospice and palliative care providers. The higher status—Level Four is the top level of the program—reflects Houston Hospice’s commitment to providing veteran-centric care and support that reflects the important contributions by men and women who served in the U.S. military. According to NHPCO, a vast majority of veterans are not enrolled in the VA and may not be aware of end-of-life services available to them, including the Medicare Hospice Benefit and VA-paid hospice care. Houston Methodist’s Walter Tower features 366 patient beds and 18 hi-tech operating rooms. Houston Methodist opened the Paula and Joseph C. “Rusty” Walter III Tower, a 22-story, $700 million patient tower housing new beds and state-of-the-art technology. The 954,705-square-foot facility in the Texas Medical Center features 366 patient beds and 18 high-tech operating rooms (ORs), including four hybrid ORs that combine advanced medical imaging devices and an operating room. The new hybrid ORs will allow for more minimally invasive procedures for cardiovascular surgery and neurosurgery. Leaders of Memorial Hermann Health System and Baylor Scott & White Health announce the intended merger. In October, the boards of Memorial Hermann Health System and Baylor Scott & White Health announced the signing of a letter of intent to merge into a combined system. Together, the two systems include 68 hospital campuses; more than 1,100 care delivery sites; nearly 14,000 employed, independent and academic physicians; and two health plans. They currently record nearly 10 million patient encounters annually. As two of the most comprehensive not-for-profit health systems in Texas, Memorial Hermann and Baylor Scott & White Health, both founded as faith-based organizations, share similar missions and values and like-minded, forward-thinking visions for the future. With approval of the letter of intent, the organizations have entered into a period of exclusive negotiations, due diligence and the standard regulatory review processes. The next stage in the transaction—a definitive agreement—is anticipated to be complete in 2019. Menninger 360 features a team of experienced interdisciplinary mental health clinicians who offer clients wraparound support, treatment and rehabilitation in their home and communities. The Menninger Clinic launched a new service in 2018 that provides treatment, rehabilitation and support to people who need intensive treatment beyond a hospital setting for mental health or sub-stance use disorders. The program, Menninger 360, is the first private psychiatric assertive community treatment (PACT) in Texas and functions as a multidisciplinary mobile team offering individualized wraparound services that help clients address real-world concerns in real time. The primary goals of Menninger’s PACT approach are to reduce or eliminate symptoms of mental illness and minimize or prevent recurrent acute episodes of mental illness and hospitalizations; meet basic needs and enhance quality of life; improve functioning in adult social and employment roles and activities; increase tenure in the community; and lessen families’ burden of providing care. Ronald McDonald House Houston opened its newly renovated flagship facility, Holcombe House, at the end of September 2018. Ronald McDonald House Houston unveiled their newly renovated flagship facility, Holcombe House, at the end of September. The $24.5 million facelift and expansion includes a new two-story tower containing 20 additional bedrooms, increasing the building’s capacity by 40 percent. Other upgrades and additions to the 65,000-square-foot facility include the kitchen and common areas, an outdoor adult patio, a game room, a supervised play and nursery room as well as a playground. A new multi-use cooking and preparation area allows residents to make meals while they stay. Many of the Shriners patients whose walking patterns are measured at the Motion Analysis Center are then fitted for braces. In 2018, Shriners Hospitals for Children – Houston celebrated the 40th anniversary of the first Motion Analysis Center to open in Texas. Clinical motion analysis is used to help under-stand complex neuromuscular, acquired or con-genital disorders that affect gait. This technology can accurately measure and describe the walking patterns of children and adolescents, ages 5 to 18, with complex movement problems resulting from cerebral palsy; spina bifida; orthopedic, neurologic and genetic disorders; developmental variants such as leg length discrepancy or bony malalignment; and club feet or flat feet. Motion analysis testing allows surgeons to evaluate problems at all joints simultaneously, which enables them to perform surgical correction of all problems in a single surgical session. Engineering Medicine (EnMed), Texas A&M University’s innovative engineering medicine track at Houston Methodist Hospital, is now included in the Liaison Committee on Medical Education (LCME) accreditation of the Texas A&M College of Medicine’s Doctor of Medicine (M.D.) program. A partnership between the Texas A&M College of Engineering, College of Medicine and Houston Methodist Hospital, EnMed is the nation’s first four-year, fully integrated engineer-ing and medical education curriculum leading to both a M.D. and master’s degree in engineering accredited by LCME. This approval allows the program to begin recruiting the inaugural class of students, set to begin in Fall 2019. Texas Children’s Lester and Sue Smith Legacy Tower opened in 2018. The hospital’s new home for heart, intensive care and surgery adds 640,000-square-feet to the Texas Children’s Texas Medical Center campus. The naming of the tower was announced following a pledge of $50 million from Houston philanthropists Lester and Sue Smith. In May, the first phase of the tower opened with six technologically advanced operating rooms for neurosurgery, orthopedics, plastic surgery, transplant and pediatric surgery—one with an intraoperative MRI—and 84 ICU beds, including dedicated surgical, neurological and transitional ICU rooms. The second phase of Smith Legacy Tower opened in September and serves as the new home for Texas Children’s Heart Center, ranked No. 1 nationally in pediatric cardiology and heart surgery by U.S. News & World Report. In November, the final phase of the tower, the helistop, opened to allow for even greater access to Texas Children’s for the most critically ill patients. City, state and Texas Medical Center (TMC) leaders convened in April to announce the creation of TMC3, a new, multi-institutional translational research campus slated to break ground in 2019, with projected completion in 2022. Named to identify Houston as the “third coast” for life sciences, the translational research campus is a collaboration between the five founding TMC3 institutions: Texas Medical Center, Baylor College of Medicine, Texas A&M University Health Science Center, The University of Texas Health Science Center at Houston (UTHealth) and The University of Texas MD Anderson Cancer Center. A third-party impact study predicted that TMC3 will drive $5.2 billion into the Houston economy and create nearly 30,000 jobs. Flanking the new campus will be a 410-room hotel and conference center, which will provide 50,000 square feet of meeting space for researchers and clinicians from around the world to convene in Houston, fostering more partnerships, education and skill-sharing opportunities. In 2018, Texas Woman’s University Institute of Health Sciences Houston Center created a College of Business. Long known for its health science programs—including nursing, nutrition, health care administration and the only physical and occupational therapy schools in Houston—Texas Woman’s University Institute of Health Sciences Houston Center also produces graduates each year in its MBA program. That program took a big step toward greater prominence during the 2017-2018 academic year with the creation of the College of Business, pulling the MBA and Master of Healthcare Administration programs under its wing. In 2017, the University of Houston (UH) Board of Regents approved the establishment of a College of Medicine focused on preparing primary care doctors to practice in underserved urban and rural communities in Houston and across Texas. In July 2018, UH revealed that, thanks to an anonymous $3 million gift, the College of Medicine’s inaugural class of 30 medical students would get free tuition. In September, UH announced a collaboration between the College of Medicine and insurer Humana, which has pledged a $15 million gift over the course of a decade to help with startup and operational costs. In October, UH revealed that a $3.5 million grant from The John M. O’Quinn Foundation will pay tuition for 10 students in the College of Medicine’s second class, as well as fund college startup costs, faculty hires, labs and a household-centered health care program for underserved communities. In November, UH announced the College of Medicine will be constructed on the UH campus. The 150,000-square-foot building will be located on a 43-acre tract of undeveloped land near MacGregor Park on Martin Luther King Blvd. at Old Spanish Trail. With the first $6 million in state funds approved by the Legislative Budget Board and the Governor to the Texas Health and Human Services Commission for the construction of a psychiatric hospital in Houston, The University of Texas Health Science Center at Houston (UTHealth) will oversee construction of a continuum of care campus for behavioral health that addresses a critical need in the state. The UTHealth Continuum of Care Campus for Behavioral Health is planned to include acute, subacute, and residential treatment and is estimated to cost $125 million. With up to a projected additional 300 beds, combined with the 274 existing acute care beds in the UTHealth Harris County Psychiatric Center, this facility will create the largest academic behavioral health hospital in the country. Supporters gathered inside MD Anderson in October 2018 to congratulate James Allison, Ph.D., on his Nobel Prize. James Allison, Ph.D., chair of immunology and executive director of the immunotherapy platform at The University of Texas MD Anderson Cancer Center, was awarded the 2018 Nobel Prize in Physiology or Medicine jointly with Japanese immunologist Tasuku Honjo, M.D., Ph.D., for the discovery of cancer therapies that stimulate the immune system to attack tumor cells. Allison is the first MD Anderson scientist to receive the world’s preeminent award for outstanding discoveries in the fields of life sciences and medicine. Allison started his career at MD Anderson in 1977, arriving as one of the first employees of a new basic science research center located in Smithville, Texas. After a few decades at California and New York institutions, he was recruited back to MD Anderson in November 2012 to lead the immunology department and to establish an immunotherapy research platform or MD Anderson’s Moon Shots Program. The Nobel recognizes Allison’s basic science discoveries on the biology of T cells, the adaptive immune system’s soldiers, and his invention of an immune checkpoint blockade to treat cancer. UTMB, for the second consecutive year, earned a prestigious national award for providing superior care to patients. Out of 99 academic medical centers nationwide, UTMB ranked fourth, earning the 2018 Vizient Bernard A. Birnbaum, M.D., Quality Leadership Award. 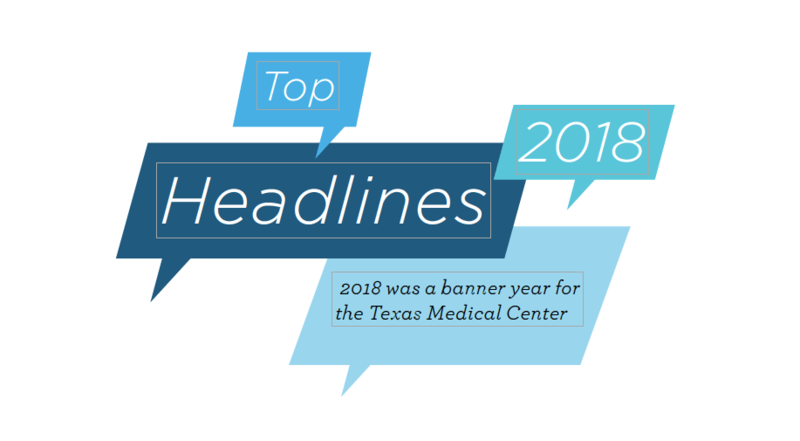 UTMB received the same award in 2017 and was ranked ninth, remaining the highest-ranked health system in Texas with the 2018 designation. UTMB, Texas’ first academic health center, is among a small number of academic medical centers nationwide recognized for demonstrating superior quality and safety performance as mea-sured by the Vizient Quality and Accountability Study, which has been conducted annually since 2005. Performance measures are based on the Institute of Medicine’s six domains of care: safety, timeliness, effectiveness, efficiency, equity and patient centeredness.